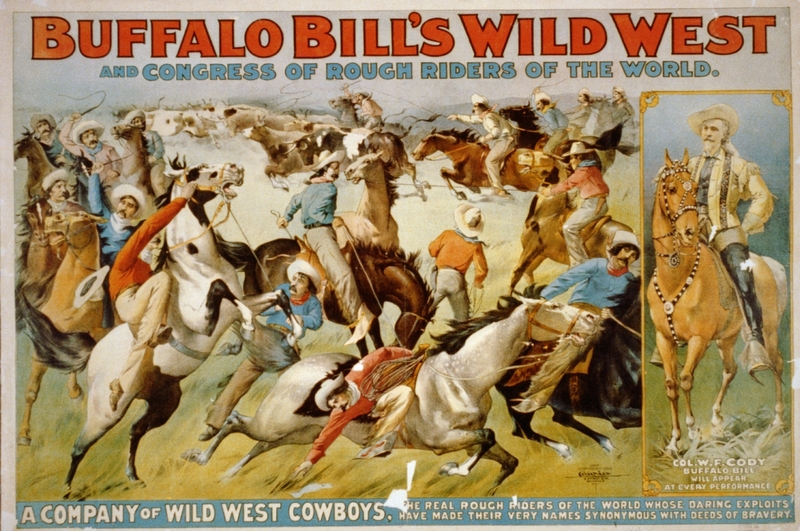 The Buffalo Bill’s Wild West Tours of Europe were a sensation. The show toured Europe eight times between 1887 and 1906, attracting huge audiences of all classes with each visit to the continent. Irene Lottini, in her essay “When Buffalo Bill crossed the ocean“ looks at the response these shows had on European culture in the early twentieth century. The man fronting this tour was William Frederick Cody, a man with a particularly colourful background. After a respectful military career where he earned a Medal of Honour for his service in the Indian Wars he was famed for shooting 4282 bison in 18 months. His nickname was earned following the result of a duel with another man, William Comstock, who also laid claim to the rights of the name ‘Buffalo Bill’. Rather than shooting each other they competed in shooting as many buffalo as they could over an 8-hour period. The final score line was a whopping 68- 48 in Cody’s favour. Now armed with the name that would arguably become the most famous of all that emerged from the American Midwest he took to the stage to perform in some of the earliest ‘Wild West’ shows. A decade later his own show was created and soon Europe’s expectant audiences lay in waiting for this unique spectacle. Before the show took to crossing the Atlantic, European readers had been growing familiar to the ‘Indian motif’ throughout the nineteenth century. Books by James Fenimore Cooper and Washington Irving painted a vivid image of the cowboy and Indian lifestyle in the Midwest and just as the popularity appeared to reach it’s climax Buffalo Bill appeared to offer audiences a first hand display, so they could meet and see these characters up closely. The attack on the primitive old Deadwood coach by the Indians, and repulse by the scouts and cowboys, commanded by Buffalo Bill, was the pièce de résistance of the Wild West Show; and next in dramatic action and sustained excitement was the attack by crawling and riding Indians upon a settler’s log cabin. Both scenes were very realistic (Anon 1887). But once the show packed up and returned home the flame of interest that had been burning in the eyes of European audiences was as bright as ever and the impact on popular culture as a result of these tours was significant. The early cinematic productions of the twentieth century jumped on this popular bandwagon and the western genre on the big screen was born. Endless novels and book series also continued to fill the shelves of bookstores, many of which featured Buffalo Bill himself. But the undertone of this wave of exotic cultural products to Europe had not gone unnoticed. Audiences understood the plight of these American natives and battles that took place were a result of imperialistic attitudes where the civilized versus the savage image was played out. Many people were drawn to the shows as they served an opportunity to witness these people and their customs before they were wiped off the face the continent, which was silently accepted as an inevitable event. The shows provided the first hand sight of these people, despite the artificial environment. The novels that depicted adventures, fortunes and romance of the Wild West fuelled the appetite of European cultures and Buffalo Bill’s satisfied this curiosity. Actualizing the western scenes, these films prove how the images of the American frontier merged with the celebration of European imperialistic politics. 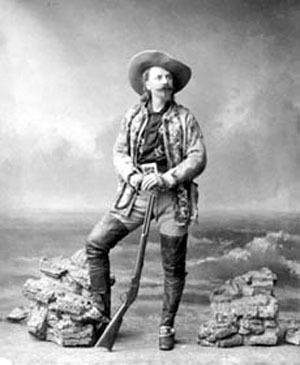 In the same years in which European countries were consolidating their colonial empires or starting their new expansionistic adventures, the ‘authentic’, ‘historical’ performance of Cody’s company stimulated the creation of an imagery that confirmed the idea of the White Man’s superiority and civilising mission…The European response to Buffalo Bill’s Wild West was an appropriation and re-creation of images reinforcing the dominant contemporaneous Eurocentric doctrines. Tags: Buffalo Bill, wild west, Wild West Show. Bookmark the permalink.